Sa Sung or Sai Sung, a kind of sea worm lives in coastal areas of Van Don and Mong Cai in Quang Ninh province, Sa Sung in Quang Ninh is considered the best. Sa Sung also lives in the waters of Cam Ranh, Can Gio. In Hai Phong town Sa Sung is call Bong Thua, and in the south it is called "earth ginseng". The most famous place to enjoy Sa Sung is Quan Lan island, located in Bai Tu Long bay, just a few hour from the World heritage Halong bay. In summertime a lot of local tourists take their tours to Halong bay and Quan Lan island, enjoy fresh Sa Sung sold in the market in the early morning, fresh Sa Sung is very good for health. At around 5.00 o'clock in the morning hundreds of people are seen walking up and down on the beach, most of them are women, they all wear the same clothes, cover all the body except the eyes, they carry a showel and a basket and a bottle of water. Most men in Quan Lan go away on business or go fishing in the sea, only women and young girls go catching Sa Sung. This industry came to Quan Lan island long time ago. Detecting where Sa Sung have been hidden under the sand was difficult, catching Sa Sung without killing them is even more difficult, unexperienced beginners often cut off the body of Sa Sung, it is hard to sell dead ones because the flesh is dirty, loosing the original sweetness. 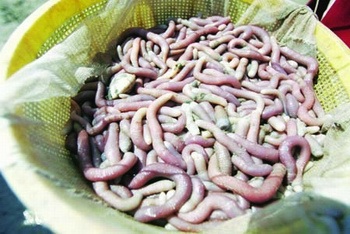 Sa Sung has red skin, they look like the earth worms, there are tiny fibers on their body, however Sa Sung is bigger than earthworm and it's bowel contains only sand. Sa Sung live in the holes deep in the sand. Like the earthworms, Sa Sung will terrify the weak minded people with its horrible looks, However the dishes from Sa Sung no one can refuse. Dishes processed from Sa Sung are literally as expensive as gold, 1 kg of dry Sa Sung is worth a tael of gold, and very few people got to enjoy Sa Sung therefore Sa Sung is only used to make soup liquid for Pho (noodle) and Bun (vermicelli). A very small amount of dry roasted Sa Sung put in a filter bag will make the liquid stronger flavour, Sa Sung is called the soul of Pho in the past time when there were no spices. Sa Sung can be baked, served with salt, chili and lemon, Sa Sung can also be mixed with pepper and grilled, diners tend to have roasted Sa Sung with beer, like shredded dried squid, it is crunchy, soft and tough, tastes sweet and fatty very enjoyable. Fresh Sa Sung can be used to make fried, baked and cooked dishes or make porridge. To process fresh Sa Sung, after washing throughly one adds ingredients to the dry roasting pan on the stove and pour to the basket, remove all those grains of sand clinging to it, Sa Sung is then ready to make delicious dishes. Sa Sung themselves have a natural sweetness the longer diners chew the sweeter it becomes.